The Boston Globe reported this past weekend that New Hampshire has dropped a plan to draw tourists to experience the state's first-in-the-nation primary. The proposed tourism campaign was scrapped due to concerns that it would draw criticism that New Hampshire protects its status as the country's first primary because of the money it brings into the state rather than the political value it brings in choosing the next president. Taking a trip to New Hampshire in the lead-up to the primary is always entertaining for political junkies such as myself. I've been caught in a crush of 30 cameramen following Pat Buchanan in 1996, listened to President Clinton in a high school auditorium in 1996, watched a PETA member in a pig outfit protest Steve Forbes in 2000, and seen candidates trying their hand at pancake flipping at a breakfast sponsored by Bisquick. With seemingly more candidates than voters, the 2008 primary campaign promises to be more entertaining than ever. The campaign is already in full swing, so anyone interested in making a trip should get a fantastic chance to see the candidates up close and personal. If you're thinking about visiting New Hampshire to see democracy in action, the best time to go is the week leading up to the primary as the candidates are criss-crossing the state almost every day. You can choose to travel across the state as well, but you can usually see a number of candidates in one day just by basing yourself in one of the state's larger cities such as Nashua, Portsmouth, or Manchester. Those cities are easy to reach from Boston, just an hour to an hour-and-a-half drive away. Manchester is the state's largest city, home to the state's biggest TV station and airport, and a good place to base yourself. The city's Merrimack Restaurant is a popular stop for candidates and the media. Nearby, the Radisson Hotel has hosted C-Span's studios and candidate events in past years. The Bedford Inn has hosted CBS broadcasts and many media members as well. To plot out your itinerary, check out candidate web sites to see their campaign schedules. Another good resource is www.nhprimary.com, which has a full listing of expected candidate appearances. One of the perks of living in Massachusetts is getting an extra holiday every April-- Patriot's Day. (Of course, that perk is negated by one of the downsides of living in Massachusetts--consistently lousy spring weather.) Patriot's Day commemorates the first battles of the Revolutionary War at Lexington and Concord on April 19, 1775. It's a civic holiday in Massachusetts and Maine (which was once part of Massachusetts), and there are some great traditions associated with it such as the running of the Boston Marathon and an early Red Sox game day (scheduled for 10 a.m. this year). One of my favorite traditions is seeing the reenactment of Revolutionary War battles. The dawn reenactment of battles at Lexington and Concord have always been a bit early for me. (This is a holiday after all!) So the afternoon commemorations are more up my alley. 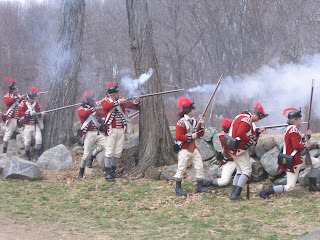 This year, the Minute Man National Historical Park staged a Saturday reenactment of the British retreat back to Boston along a half mile of the Battle Road with hundreds of British and colonial reenactors. These battles really give you a feel as to how different warfare was a couple of centuries ago. One fashion tip if you go next year: Keep the red coat at home. You might as well wear a Yankee hat at Fenway Park. 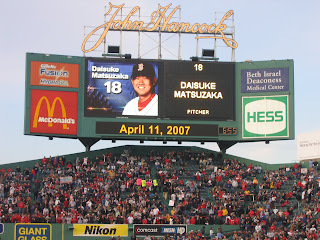 Sorry for hitting the Boston/Japan theme a little heavy in recent posts, but this is worth it. I was contacted by NHK, the Japan Broadcasting Corporation, to do an interview about the article I wrote in The Boston Globe on the Fenway Park bar in Kyoto. So yesterday, I was honored to have a four-person crew come in and set up shop in our living room to film the interview. I had no idea it was going to be that big of a production complete with a boom mike and lighting setup. We talked about how we stumbled on the bar in Kyoto, what I thought about the bar, why I wrote the story, and how I thought Dice-K would do for the Sox. I also talked about the story of how the Red Sox front office had read the article and sent along a nice gift to the bar. 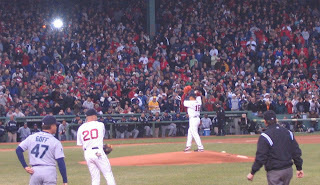 They filmed some scenes of me watching the Sox on TV and filmed the article and some pictures I had. This was my first time being interviewed on camera, and it was really fun that they came to our house. Also interesting that our living room might be seen half the world away, but not here in the U.S. Not sure if any of it will make the final cut, but I'll keep my fingers crossed. If you're in Japan, the air date is Monday, April 30 from 19:30 to 20:43 on NHK's Sogo Channel (Channel 1 in Tokyo, I believe). up early (or late) catching this one back at Fenway Park in Kyoto. Boston has a handful of "Sister Cities" around the globe with which it exchanges people, ideas, culture, and education. These cities include Barcelona, Spain; Strasbourg, France; Hangzhou, China; Padua, Italy; Melbourne, Australia; Taipei, Taiwan; and Sekondi-Takoradi, Ghana. Boston's first Sister City, though, was Kyoto, Japan. Boston doesn't have the same wealth of cultural history of Kyoto (few cities in the world do), but you could argue that both cities are the historical, cultural, and educational capitals of their respective countries. In addition, Kyoto is a smaller city in the shadows of the huge metropolis of Tokyo, similar to Boston’s relationship to New York. So we can commiserate about our inferiority complexes over glasses of Sapporo and Sam Adams as well. Kyoto was the imperial capital of Japan, and it's home to castles and thousands of shrines and temples with traditional Japanese architecture and beautiful gardens, which are filled with color during the fall and the springtime cherry blossom season. I went on Friday to Robert Castagna's excellent photographic exhibition of Kyoto, which captures the essence and beauty of the city. The images are on display at the Rolly-Michaux Gallery at 290 Dartmouth Street through May 7. Oh, and if you're ever in Kyoto, check out the Fenway Park bar, just one more connection between the Sister Cities. It's run by my new friend "Tiger," who was a Sox fan even before any of us heard of Dice-K. Here's a story I wrote about it in The Boston Globe last October. Good news! I won third place in Perceptive Travel's Citiescape Asia Photo Contest for my photo of the Sydney Opera House. Check it out along with the other winners! For some more photos of mine, check out my Panoramio page. I keep saying that sports travel is one of the fastest-growing areas of the travel industry. (It's the subject for one of my current book proposals.) The Travel Industry of America reports that during the past five years, more than 63 million American adults have traveled 100 miles or more to attend an organized sporting event. According to Street & Smith's SportsBusiness Journal, spectators in the U.S. spend more than $12 billion a year on travel to and from organized sporting events. Once again, sports travel has been covered by the mainstream media in an article on baseball vacations in last Friday's New York Times. According to the article, more hotels are offering baseball packages that provide everything from tickets to transportation to souvenirs. It also reports on the growth of tour groups offering baseball-focused trips. The Times article mentions the Boston Harbor Hotel, Boston Marriott Copley Place, and Hotel 140 offer room packages with two Red Sox tickets. Rates start at $369 for the Hotel 140 package. Interesting note confirming U.S. is truly Red Sox Nation: for a September game between the Sox and Yankees last September, Stubhub sold tickets to fans from every state except South Dakota. Not even the Super Bowl attracted as geographically diverse a crowd.